The "Sense of Snow" book fair drew crowds to central Moscow with its innovative program – despite being held outdoors during one of the coldest weeks of the year. The outside temperature may be -20, but the Museon Arts Park in central Moscow is swarming with people. Children are running through piles of snow between solitary sculptures, trying to climb over the walls of an ice castle and playing on swings. Their parents are freezing beside them, big bags of books in their hands. A large tent has been set up nearby, and a large crowd is surrounding it. This was the scene at the “Sense of Snow” book fair, the first of its kind. Many small publishers pulled out all the stops to create winter-themed activities based on their books for the fair. The event also celebrated the fifth anniversary of the Paulsen publishing house, which specializes in Arctic non-fiction. Children’s publishing houses Samokat and KompasGid also organized a special program based on their books for the young visitors to the fair – a tour through winter in several countries. “For example, we make a stop in Norway, native land of Tonje Glimmerdal, a character in one of our books,” said Helga Pataki, who organized the children’s program as a representative of Samokat. 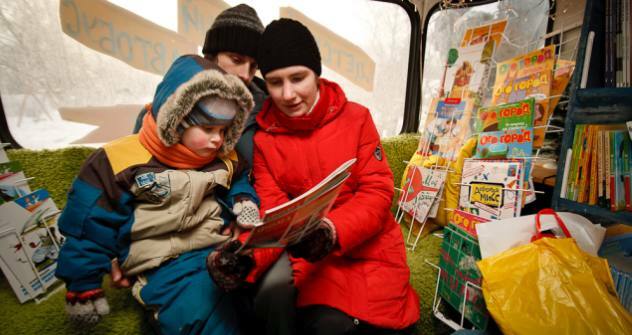 The Bumper book bus, symbolizing Wrangel Island, was also popular with visitors during the fair. On the bus, children learned many exciting facts about the way animals spend winter months in the north. Wrangel Island is a breeding ground for polar bears. Books were on sale in the tent. The small publishing houses that took part in the fair believe that coming up with unique events is one way to get them on readers’ radar. Their products are not often sold in big bookstores and they do most of their business at fairs. “It is important to make a name for yourself, and new formats are an excellent opportunity for this. A winter fair at -20 is arguably the most extreme book fair of all,” said literary critic Konstantin Milchin. “Also, the public loves the energy felt here. Maybe they should have made it even more extreme - turn it into a snowboarding festival or a survivalist fair." The extreme temperatures did not put off the crowds. “We love this fair. We have brought the whole family and we have put on warm clothes,” said Maxim, 30, his hands full of books. “Our son took part in the trip but he found it even more amusing to play on the ice slide and the swings. We also bought many incredibly exciting books and souvenirs."